This wonderful book takes place in the stunning Belgian city of Bruges during the First World War. Manon Wouters had a peaceful life; she lived in a quaint house with her mother, father and younger brother, Florien, but when World War I began, her once quiet life erupted into chaos. Her beloved father was taken hostage when the Germans invaded her country. Eventually he and two other fellow Belgians were executed, much to the horror of Manon and her family. After she escaped her war torn country, Manon became a nurse and helped heal the wounded British soldiers, but eventually she was approached by the Allies, who asked her to become a spy and return to her family. Manon’s new life as a spy is difficult and lonely. She starts collecting little bits of useful information and passing it on via other spies, but her job is becoming increasingly more dangerous. All of Britain’s supplies that are shipped in are being bombed by the Zeppelin planes and the enormous Gotha Bombers, and Britain is starting to starve. Even though she risks execution and her many enemies greet her at every corner, Manon continues her challenging work, much to the displeasure of the Germans. 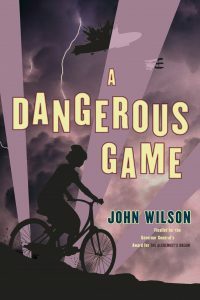 A Dangerous Game was a fantastic book, and I would recommend it to anyone who enjoys reading books that take place during the First World War. Review by Anya, age 15, grade 9.